This is a simple extension that provides a basic controller class that can be extended to meet the needs of the developer. The intention is to provide a fast path to data management by allowing the user to define forms and override the data interaction with custom manipulations once the view logic is in place. The name of this extensible class is CrudRestController. CRUD is a set of functions to manipulate the data in a database: create, read, update, delete. REST is a methodology for mapping resource manipulation to meaningful URL. For instance if we wanted to edit a user with the ID 3, the URL might look like: /users/3/edit. For a brief discussion on REST, take a look at the microformats entry. That will provide a simple and working CRUD controller already configured with some simple views to list, create, edit and delete objects of type Movie. The __setters__ option provides a way to add new simple methods on the fly to the controller. The key of the provided dictionary is the name of the method, while the value is a tuple where the first argument is the attribute of the object that has to be changed. The second argument is the value that has to be set, if the second argument is a callable it will be called passing the object to edit as the argument. In the previous example calling http://localhost:8080/tickets/5/done will set the ticket 5 status to done. Well that won’t actually get you anywhere, in fact, it will do nothing at all. We need to provide CrudRestController with a set of widgets and datafillers so that it knows how to handle your REST requests. First, lets get all of the Movies to display in a table. We add movie_id to the limited fields so that the “__actions__” field can provide proper links to this primary key. 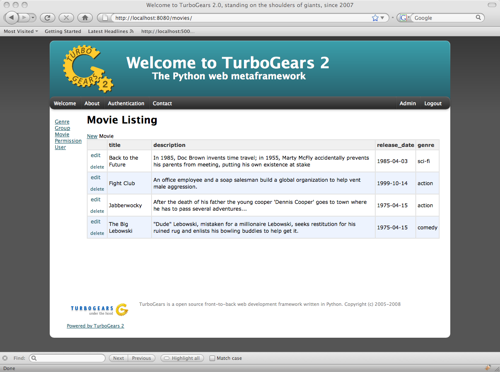 You can now visit /movies/ and it will display a list of movies. You can now visit /movies/new and get a page that looks like this. Now it is a simple as adding our filler and form definitions to the MovieController and close the loop on our presentation. Here is what the form looks like when we go to edit it. We have really been focusing on the View portion of our controller. This is because CrudRestController performs all of the applicable creates, updates, and deletes on your target object for you. This default functionality is provided by sprox.saormprovider.SAORMProvider. This can of course be overridden. CrudRestController extends RestController, which means that any methods available through RestController are also available to CRC. If you are familiar with RestController you may notice that get_one is missing. There are plans to add this functionality in the near future. 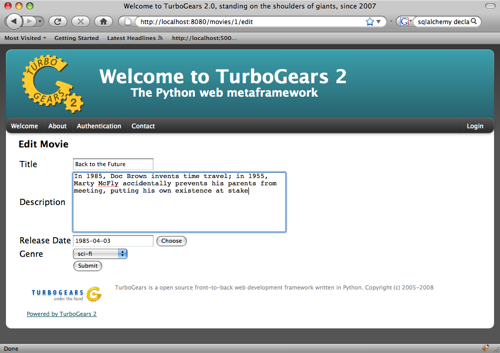 Also, you may note the ?_method on some of the URLs. This is basically a hack because existing browsers do not support the PUT and DELETE methods. Just note that if you decide to incorporate a TW in your edit_form description you must provide a HiddenField('_method') in the definition. You might notice that the function has the @expose decorator. This is required because the expose decoration occurs at the class-level, so that means that when you override the class method, the expose is eliminated. We add it back to the method by adding @expose with the inherit parameter to inherit the behavior from the parent method. 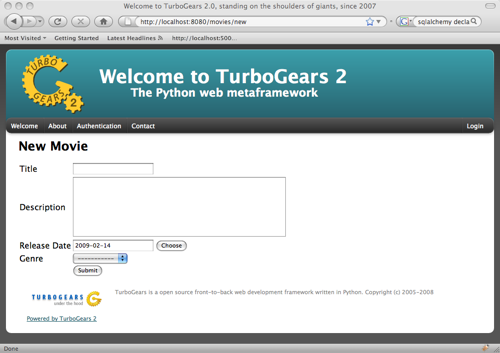 For more details you can refer to the TGController Subclassing documentation. Which results in a new listing page like this. CrudRestController represents sort of a sweet-spot with respect to functionality. It doesn’t do everything for you, but it can save you a bunch of work, especially when you are prototyping an application. If you need more flexibility, you should take a look at RestController, which provides no form/crud functionality. 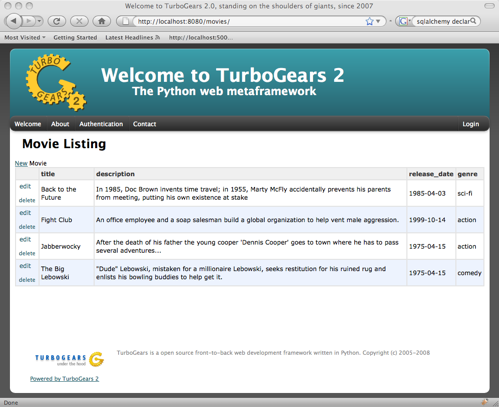 If you are really looking for something that makes all of the forms for you, but can be configured, take a look at the Turbogears Admin System.